A couple of weekends ago, I had the distinct privilege of attending several games at the Women’s Soccer World Cup Tournament in Canada. I spent an enjoyable long weekend with my family watching talented athletes at the summit of their sport compete for their countries and the right to be called world champions. But of course, Imagine! and my work are never far from my mind, and as readers of this blog know, I frequently find connections between my job and my experiences outside of that work. My experience at the World Cup was no different, and naturally I feel compelled to share the connections I observed. They are ambassadors for the fans in the stands. They are ambassadors for the fans watching on TV. They are ambassadors for girls (and boys) across the globe who love soccer and view the players as heroes and role models. They are ambassadors for their countries. They are ambassadors for up and coming players. They are ambassadors for the media. They are ambassadors for FIFA. That last role presents an interesting dilemma. Sometimes, for the greater good, we all find ourselves playing roles as ambassadors for people or entities we may not fully support. For those who aren’t aware, a coalition of female players filed a lawsuit against FIFA and the Canadian Soccer Association late last year, claiming that forcing the women to play the World Cup on artificial turf in Canadian stadiums amounted to gender discrimination because the men had always played on the real stuff and would do so for the foreseeable future. Although the lawsuit was eventually withdrawn (the games are being played on artificial turf), it can’t have endeared either the players or FIFA representatives to each other. But the show, and the games, must go on, and now the women find themselves in the awkward position of acting as ambassadors for an organization they may not feel has their best interests at heart. This sort of “conflict of ambassadorship” occurs in all walks of life. It certainly occurs in the field of providing services for individuals with intellectual and developmental disabilities. Think of the many ways we must be ambassadors – for those we serve, of course, but also for: Direct Support Providers (DSPs), the community, for the network of providers, and even for the regulating bodies that oversee our work. Acting as an ambassador for one of those people or organizations listed above frequently comes in conflict with acting as an ambassador for another. We can’t just focus on one. If our only focus was ambassadorship for people accepting our services, for example, we might lose our ability to attract and retain quality workers. Of course, the opposite is true as well – if all we did was support our DSPs, it is likely that the end users of our services would see a decline in the quality of their services. The best a person or an organization can do is to find a balance between these competing ambassador roles. At Imagine!, we strive to find the path to supporting all of our various interested parties in ways that are mutually beneficial. It doesn’t always happen perfectly, and sometimes there are conflicts. But we work through them with the end goal of offering more self-reliance for the people we serve. Being an ambassador can mean you have many roles, and the roles aren’t always easy to navigate, but when you are successful, it can be very rewarding. 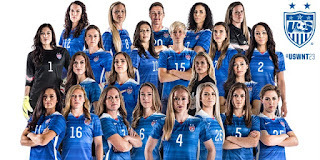 I’ll end this by wishing the US Women’s Soccer Team best of luck in the World Cup, and thank them for taking on the role of ambassador for so many of us. I’m honored to know they are representing our country. By the way, if you haven’t been watching the games, you really should start. There is some remarkable soccer being played, and it is not to be missed.